Michelin Primacy HP tires are the ideal summer tires. They offer excellent performance and handling that is reliable in dry and even wet conditions. Not intended for near freezing conditions, snow nor ice. Designed to offer exceptional braking and steering control and handling. Michelin Primacy’s stopping distance is up to 5% shorter than the competition due to their unique rubber compounds. Considered luxury performance tires that come standard on Lexus GS 430, Mercedes E-Class and Audi A6 they offer a comfortable and quiet ride. Primacy HP are manufactured using Michelin Comfort Control Technology offering less vibration and road noise. Yet they can still be pushed hard around corners due to their rounder shoulder and European style handling profile with reinforced sidewalls. Available in Zero Pressure Technology that allows the car to be driven up to 50 miles with no air pressure. Due to their low rolling resistance, Primacy HP offers superior energy efficiency and reduced CO2 emissions, considered among the highest in efficiency in the market. Michelin strives to manufacture tires that offer a positive contribution toward fuel efficiency and the global environment. With the application of the Green X symbol, you can be assured your tires have these characteristics without compromising on traction and treadwear. 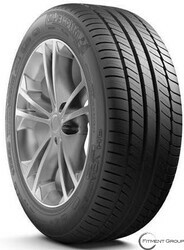 As always these offer the Michelin trademark of long wear, safety and competitive performance.